As discussed earlier this month, the US is facing a "fiscal cliff", a sudden expiration of tax breaks and spending programs that could have severe consequences for the fragile US economic growth. The issue is now getting some attention in the media. CNBC: - The United States’ economy could shrink as much as 4 percentage points in the first half of 2013 if Congress fails to address the expiration of $600 billion worth of tax breaks and jobless benefits by the end of this year, according to Goldman Sachs. In a report issued on Tuesday, Goldman said in the worst-case scenario, the “fiscal cliff” facing the U.S. will shave almost 4 percentage points off gross domestic product (GDP) in the first half of 2013. The fiscal cliff refers to the expiration of Bush-era tax cuts and the payroll tax holiday, as well as the end of extended unemployment benefits and the automatic spending and budget cuts mandated by Congress if lawmakers fails to reach deficit reduction goals. According to Goldman, if the knock-on effects of a GDP contraction are considered, that is, reduced growth in one quarter weighs on the following quarter, the U.S. economy could experience a 5-percentage-point reduction in annualized quarter-on-quarter GDP. Expiring 2001 and 2003 Bush era tax cuts will be extended again (this is probably the most controversial assumption). The "sequester" (which kicks in because the Supercommittee was unable to reach an agreement) required cuts in discretionary spending are delayed past 2013. It would likely be replaced with longer-term spending cuts. Unemployment benefits will be phased down gradually after the end of 2012, rather than expire on schedule. The payroll tax cut would in fact expire. Reductions in federal spending that are already in play will start taking effect. 2. 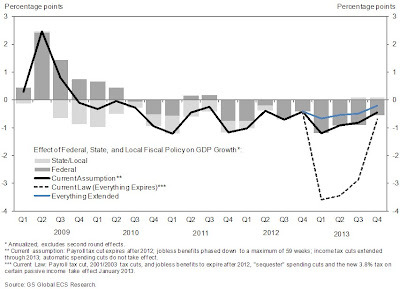 Status quo: Everything gets extended (but the expected slowing in federal spending continues). 3. 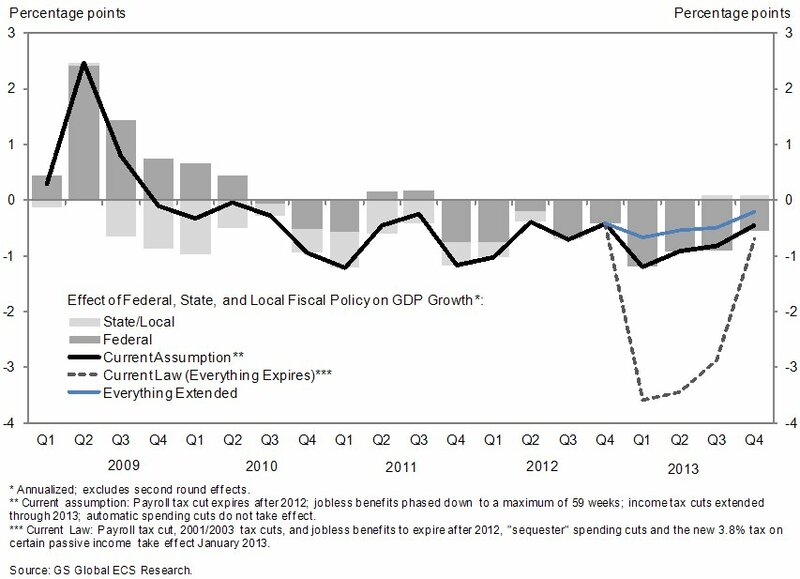 The "fiscal cliff": All the tax breaks expire and spending cuts kick in as described here. The chart below shows the impact of each of the three scenarios on the US GDP growth. It's important to note that if the GDP growth is already negative (for example due to a spike in oil prices), the fiscal impact will make it even worse by the amounts shown in the chart (which is the point that CNBC seems to miss).